Twitter has announced a range of new updates aimed at uncovering individually relevant, happening discussions, and highlighting them to each user. The changes mostly focus around the expansion of Explore, with several of Twitter’s past experiments with discovery tools now coming to light. And they could be significant – here’s what’s been announced, and what each element means for the broader Twitter experience. First off, on Explore specifically – Twitter is adding new topic tabs to your Explore page, in addition to the filters by content type. The topic tabs will highlight trending discussions, similar to Trending Topics, and it’ll be interesting to see what, exactly, the new options add to the discovery process. Twitter’s also adding related news, events and stories panels at the top of Explore, which will relate to your entered topic searches. 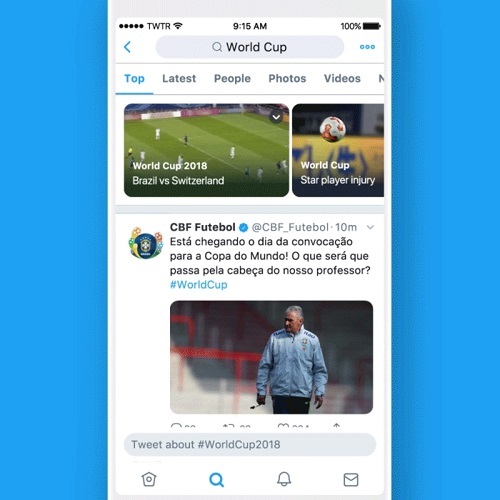 The option is similar to the ‘Happening Now’ module Twitter launched for sports events in the US last October, providing a scrollable panel to connect you through to relevant coverage. In fact, those Happening Now alerts have formed the basis for much of this update – in addition, Twitter will also expand the Happening Now alerts to cover not only sports, but also breaking news, personalized to your interests. The idea here is to get users more engaged in real-time conversation, without interrupting their regular Twitter usage – scroll down and you move past the top module and on to your regular tweet stream. It’s a good idea, and will no doubt get more users tapping through – as noted, Trending Topics already serves a similar function, but the idea is that this listing will be more personalized and more curated, making it easier to follow along. As you can see here, the format, when you do tap through on a topic, has also been updated – there’s a curated ‘For you’ stream in Explore, and when you tap on a subject, there are options to see the latest or recap tweets (for sports events). For others, there’ll be listings of live and top tweets, with a constant compose prompt at the bottom, inviting you to participate in the discussion. It’s a good layout, and again, it should see more users getting more involved in trending discussions – there are some concerns about the capability of Twitter’s algorithm matching, but we’ll get to that in a moment. Twitter’s also looking to get users involved by adding new push notifications for major events, customized based on who you follow and what you tweet about. Twitter has experimented with these before, but they’re now looking to make them more of a feature. It’s a risk, but one that could pay off if done right – you can also, obviously, switch these off if you choose. And the last major update relates to Twitter Moments, which has had a confused history, and has never really found its true place within the Twitter experience. As noted, Moments hasn’t lived up to Twitter’s initial, lofty expectations for the offering, though it does add something interesting to the Twitter mix. Clearly, what exactly Moments adds is still not 100% clear to Twitter itself, so the option now sees another significant change – though it’s hard to see this update significantly boosting Moments use. A couple of years back, Twitter settled on its new #WhatsHappening focus. Providing ‘in the moment’ coverage had long been a key element of the platform, but this push cemented it, and has become the platform’s guiding light ever since. But they have had problems enacting it. Twitter’s been trying to get more fresh content into user timelines, through algorithm updates, Explore page changes, even push notifications for certain events. But finding a way to maintain the platform’s real-time focus, while also alerting users to happening events, has proven difficult. 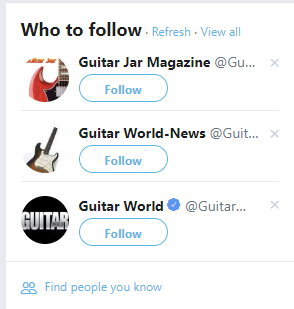 This has been exacerbated, to some degree, by Twitter’s sensitive algorithm – for example, I don’t play guitar, I have no interest in the guitar scene. But a friend of mine does, and if I happen to interact with him, even through a single reply or like, this is what happens to my ‘Who to Follow’ list. Twitter’s algorithm is particularly sensitive to recency – in an effort to stay up with your changing interests, it seems that the algorithm can be fairly heavily influenced by minor signals. That’s likely to remain a problem within this new approach – the algorithm will work to detect content that you’re likely interested in, to show you more of it in Explore, at the top of your timeline, etc. The accuracy of those matches will play a key role in how effective they are – and that’s an even bigger consideration in relation to push notifications. Get it right, and this could be a valuable addition. Get it wrong, and it could get real old, real fast. But it is also worth noting that Twitter has been getting it right. 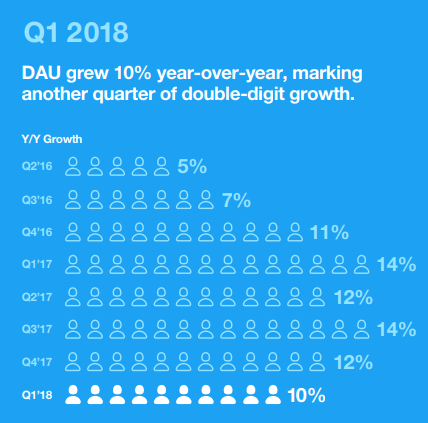 According to their performance reports, their algorithm-driven efforts have helped to boost user engagement – Twitter’s not seeing massive growth in monthly active users, but those who do come to the platform are using it more and more often. That shows that Twitter’s algorithm-defined efforts, while not popular with all users, are helping to uncover more relevant content, and are helping the company move towards its overall goals. Of course, MAU stats are what we discuss most – more users means more people to advertise to, which means more revenue potential. But that metric – inevitably matched against Facebook’s growth – is somewhat unfair, and in some ways misleading. Where Twitter, and other platforms like Snapchat and Pinterest, can win out in the social ad stakes is through niche focus, showing advertisers that they may not have as big an audience, but the people that do use their platforms are highly engaged. Twitter, for example, airs National Lacrosse League matches as part of its live-streaming slate, and the NLL is obviously nowhere near as popular as the NFL or NBA. But no one else is airing it – if you want to reach an engaged lacrosse audience – say, if you make and sell lacrosse gear – you’ll want to go to Twitter. Twitter’s broader effort has been to focus on a breadth of these more niche events, making it the go-to for each – so while Twitter can’t compete with the bigger players airing the latest major events and matches, it can accumulate a spread of smaller, niche offerings, and become the home for each. That’s a harder path to steady monetization, but it enables Twitter to build out its ad offerings, while also expanding their business. But again, the key to truly maximizing this lies in algorithm detection, ensuring that all interested users are seeing this type of content, and engaging as much as possible. That puts fairly heavy reliance on Twitter’s machine learning systems. As noted, evidence suggests their current efforts on this front are working. Hopefully they continue to refine and improve them, helping these new offering take flight.